The Hotel Ala is a 2-star family run hotel in Riccione, located near the beach and the spa. The property is fully air conditioned and has free WI-FI, bar open all day and beach service. Small pets are allowed on request. The hotel is conveniently located: a short distance from the Terme di Riccione and the beach, both about 5 minutes on foot. 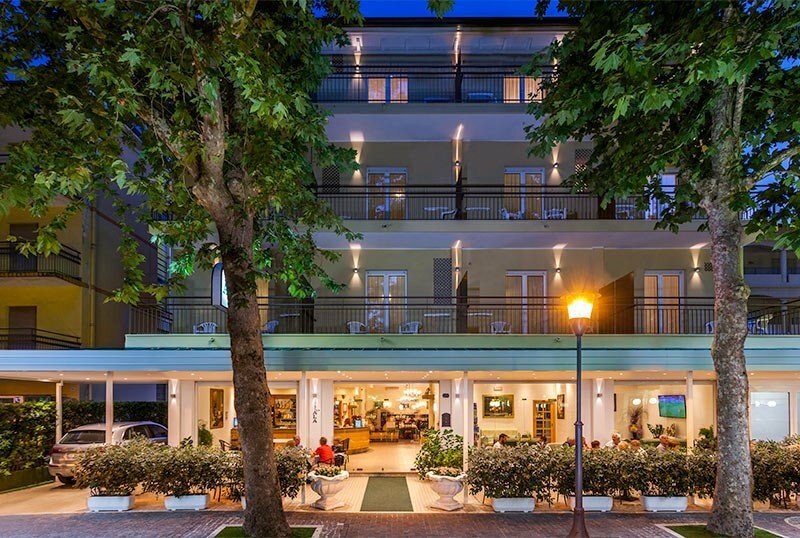 The hotel overlooks Viale Trento Trieste and a 15-minute walk will take you to the center of Riccione: Viale Ceccarini, the train station, the Palacongressi di Riccione, all the nightlife and shopping venues. All rooms have door opening with electronic key, air conditioning with manual adjustment, WI-FI, safe, electric shutters, heat and soundproof windows, telephone, digital terrestrial TV, renovated private bathroom with shower with glass box and phon. Some rooms have other window balconies. Open-air porch, large hall with 60 '' TV, bar open 24 hours a day and free bicycles. PARKING : paid, guarded and available subject to availability. PETS : small pets allowed, to be agreed with the management. BREAKFAST : international buffet breakfast with hot and cold drinks, croissants, ring-shaped cake and homemade pies, biscuits and yogurt, as well as cheeses, cold cuts and fresh bread. LUNCH AND DINNER : 2 choice menus of local cuisine with meat and fish dishes, buffet of appetizers and vegetables. OTHER: every Sunday the chef prepares a great cake of ever-changing pastry, with fresh fruit, meringues, cream puffs, refined and genuine products. At meals : seats at the table, baby food and flexible staff to the requests of parents. On the beach : entertainment service, baby corner, baby sitter and playground area. The hotel has an agreement with the nearby equipped beach, Bagni Cesare n. 50, which offers sunbeds, beach umbrella, indoor and outdoor hot showers, use cabins, also equipped for children with changing table.Among the services dedicated to children: live entertainment and baby sitting, playground, organization afternoon snacks. The bathroom also includes a bocce courts and table tennis, beach volleyball and beach tennis courts, bike beach and gym. The lounge bar offers hot and cold drinks and TV, massage chairs and herbal teas are available. Sports lovers can rent a racing bike directly at the beach. The prices of the price list are per day, per person, for a stay min. of 5 nights (excluding Bridges and Holidays). TOURIST TAX: excluded. € 0.70 per person per day up to a maximum of 7 consecutive nights; minors are exempt until the age of 14 is reached. 1 Adult + 1 Child: in Double Room special discounts (limited availability for some rooms only). - Parking must be requested at the time of booking (subject to availability). - It is preferable to stay with arrival and / or departure on Saturday or Sunday. - The Hotel management reserves the right to make changes, if it deems necessary. - At the discretion of the management, in case of early departure, 3 nights may be calculated as compensation. - All bookings are valid if accompanied by a deposit upon confirmation of booking. All rooms have a renovated bathroom with shower cubicle, sliding rail and hairdryer. full board with drinks at meals, sun beds and umbrella on the beach are always included in the price.